It is a word that we ignore easily. It is right we grew up in the world “don’t cry over spilt milk”. The point of this is that it is pointless to worry about something that can’t be undone. The problem I have is what if we ask a different question – why do we feel bad about spilling milk and why is it making us cry? The pointless appears only after we have are faced with a result we don’t like. Yes, the popular notion is, if we made better choices we would have had better results. The point is that life choices are not like mathematical problems. By doing something right, there are no guarantees of getting the right result. So, it is hard to know what is the right or the wrong result. To cry or not to cry. 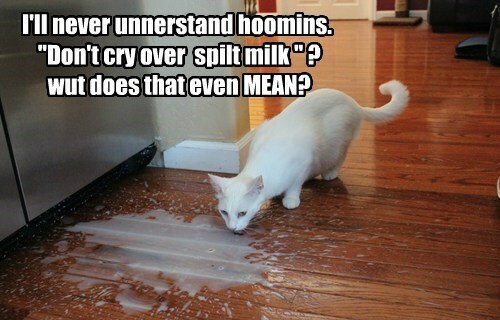 My point is know that there is nothing wrong with spilling milk. It is likely you don’t even like milk. So, if you like it, cry a bit and just know only that milk on the floor is gone and you will never have it (but the cat might). Still, it is possible that milk was bad for you. And even if had not gone bad, now you have a chance to find better milk…c’est la vive. ← Deja-vu all over again? How Sustainable is this Current App Ecosystem?